At first glance, the young woman found in the early hours of the morning where bombs have landed is just another casualty of the previous night's air raid. But when the post-mortem shows signs of strangulation, Detective Inspector Jago is called on to investigate. DI Jago's initial interviews yield little fruit; no one can think of a reason why Mary would be murdered. But as the investigation continues DI Jago begins to uncover a trail of deception and betrayal. About "Fifth Column (#02 in The Blitz Detective Series)"
Mike Hollow studied languages at Cambridge, and then worked for the BBC and then Tearfund. Now a freelance writer and editor, he lives in Basingstoke with his wife Margaret. A popular poet, his work has been widely performed and has appeared in many collections. 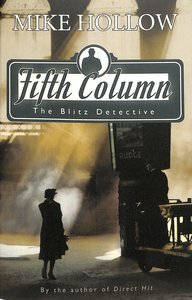 Customer Reviews For "Fifth Column (#02 in The Blitz Detective Series)"
If you love old-fashioned detective stories from the greats of the UK and Commonwealth (Ngaio Marsh, PD James ...) - then this is for you. I loved the historical details of what it was like to live in the Blitz. Will look forward to the other books in the series.